All the Eeveelutions are here to help you with your daily makeup routine! Make sure you’re always looking impeccable with this set of 9 Pokemon makeup brush set. An adorable gift for any Pokemon fan! Light up your keys like a true Pokemon Master should with a mini 3D etched LED Pokeball. Each one contains a Pokemon trapped inside that glows brightly on a handy keychain so you can always have your companion by your side. Listen to all your favorite tunes through retro gaming styled cube speaker! This wireless Bluetooth speaker is inspired from the original NES controller, with the giant DPAD acting as the controls for the power, volume and play/pause functions. Luna has some critical advice, you need to brush your hair! Keep your hair looking silky and tangle free with this cute brush from Sailor Moon. Features a molded Luna design with the cat’s name written on the handle. 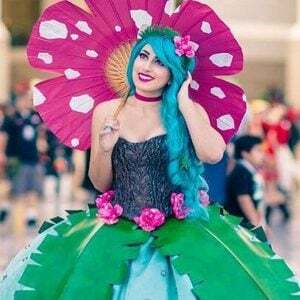 Be the center of attention as you catch all ’em eyes with this beautiful Venusaur ball gown! This two piece ensemble features an adjustable corset bodice in hand painted brown textured leather with a skirt embellished with glass beads and vinyl leaves. Bath time is going to get a whole lot more fun if you’re a Hamtaro fan! Once placed in water, these delightfully scented and therapeutic bath bombs will dissolve to release a surprise Hamtaro figure waiting inside! If you’re a huge fan of reading manga, you can now flaunt your favorite volumes with one of these cool charms! Miniaturized versions of your favorite mangas are made into fashionable necklaces. Custom requests and keychains also available! Searching for a legendary weapon to stop both rain and Ganon? Look no further. Instantly recognizable, this Master Sword umbrella is perfect for when someone forgets the Sun Song and plays the Song of Storms instead. The little fire demon from Howl’s Moving Castle has gone from burning home cooked meals to cursing your morning coffee instead. This silicon coaster will protect any surface from hot mugs and nasty coffee rings. This No Face mask actually looks like it comes from the world depicted in Hayao Miyazaki’s movie Spirited Away! Made from strong, lightweight materials and hand painted, this replica is more realistic and nicer than the usual boring, low quality masks. Proudly show that you’re the ultimate Pokemon fan when you put this realistic Pokeball unit on display! Designed to look as lifelike as possible with details inspired from the anime, this custom made Pokeball even comes with a clear and display case. Have you just passed the State Alchemist test but they forgot to send out your certificate? Don’t miss out on these customized documents that include your own name and special title. Time to come up with a cool sounding Alchemist name! There’s no need to go into any dungeons for these shiny Heart Pieces! Inspired by the Zelda series, these scented glycerin soaps contain an acrylic heart gemstone inside! It’s yours to keep until you’re in desperate need of some extra life. This Hylian Shield might be impractical for combat, but it’ll hold all your Switch games! With 12 cartridge slots available, this 3D printed cartridge case comes with a display stand that makes it the perfect addition to any gamer’s shelf. If you’re looking for an adorable way to warm both your soul and body, this stylish Fullmetal Alchemist blanket is for you! This wonderful throw blanket features a cute chibi illustration of Alphonse Elric carrying a little kitty! This isn’t your everyday Digivice, inside is USB flash drive! This awesome Digivice replica creates a very convenient way for any Digidestined to carry around all their data needs. Available in a range of colors and either 32GB or 64GB. It’s time to du-du-du-DUEL!!! Decorate any room in your home or office with this 10 inch Yu-Gi-Oh inspired wall clock. The next time someone asks you what the time is, they better have their dueling decks on them! It’s about time you upgraded your heroic gear with a battle ready Hylian Shield! This authentically decorated replica is steel plated to give aspiring princess rescuers that much needed defense when taking on enemies across Hyrule.